If you are a songwriter who is putting your all into your craft, and need a quality audio interface that will suit your needs but don’t know where to turn, don’t worry. With a wide range of interfaces available on the market today, we completely understand the need for a unit that fits your needs for recording demos to send to clients, or to add to your catalog that won’t break the bank, but still meets all of the standard audio requirements of the modern industry. And with loads of new audio tech being released by the dozens, seemingly every week, it can be a hard feat to find your needle in the haystack. When buying a new audio interface there are a few things that you should consider. For example, it’s worth thinking about the number of inputs that you need. Many songwriters will only need one or two, but some might need more. It’s also worth thinking about how the interface connects to your computer. Most these days use some for of USB, whether it be the old-style USB-A connector, or the new USB-C connector. We, however, have got you covered — here are the best interfaces you can buy on the market today that will fit all of your recording needs, and maybe even moreso. 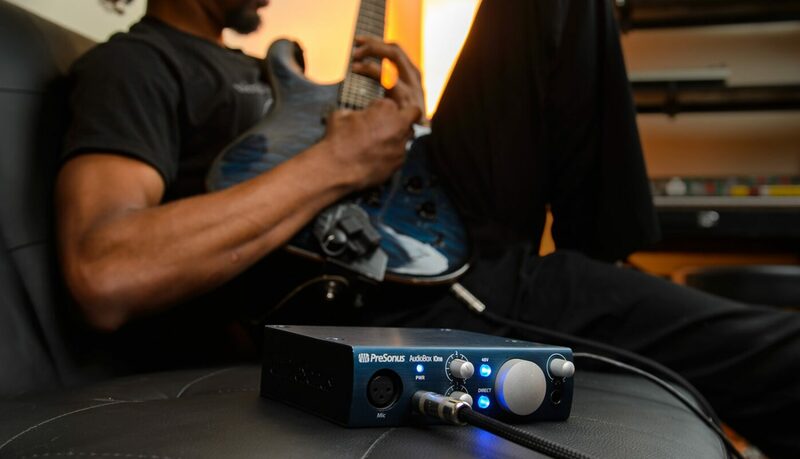 For songwriters who have a very small amount of instruments to work with, or those who always record demos one track at a time, the PreSonus AudioBox iOne is a perfect tool. It has a very user-friendly layout with one XLR mic input, and one 1/4″ line input right on the front of its face. It also contains a single pre-amp for your microphone input, and a line-level controller for your instrument. Towards the right hand side, you can find a large knob for your monitor level, and a small knob and input for headphones. In the end, if you’re a songwriter who only needs a simplistic setup to get your stuff recorded for your personal library of songs, or for sending to potential clients, the PreSonus AudioBox iOne is the right interface for you. If you’ve had a simple one-input setup for a while now, and are ready to upgrade — or even if you already know you need something with two available mic pre’s, your best bet is definitely going to be with the Scarlett 2i2. 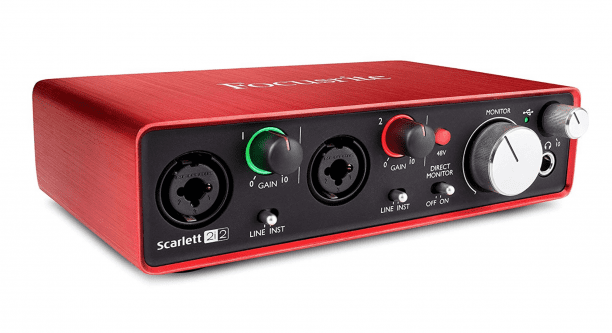 This interface is widely popular among songwriters and home recording engineers as a way to record up to two microphone inputs at a time that rides in tandem with Scarlett’s great sounding preamps and signal processing. Instead of allocating inputs to a specific XLR or 1/4″ connector type, this interface comes with hybrid inputs so you can plug in either one. The two available gain knobs are also color light assisted, so you can easily tell if you are in the green, orange, or red without having to consult your DAW every time. Like the PreSonus AudioBox iOne, this interface also comes with a monitor level knob, and headphone output. With its two-input versatility, this box is great for songwriters out there who need the flexibility of recording a piano track with a singer at the same time, or so to speak. Best of all, the Scarlett 2i2 is also very affordable and looks beautiful on your desk as well. Although its design is quite simple and bare, the Tascam 4×4 is an amazing recording interface for your small-group live recording situations. This device contains four individual inputs and preamps, equipped for XLR or 1/4″ connectors. Its preamps sound colorful, but won’t affect the input signal to a degree beyond expectation. It’s also equipped to apply phantom power to all inputs as a whole, so you can easily record with a condenser microphone alongside some dynamic microphones easily. Although, because it applies to all 4 inputs, we don’t recommend using a ribbon microphone alongside a condenser using this interface, since you could easily burn its internal components. On the back end, the Tascam 4×4 sports two sets of stereo outputs which can be used to send to main output monitors, and to an external source as well. If you have a very small group with two to three performers to record with a simplistic setup, this interface is right for you. If you need an interface that blends multi-input capability, and supports the absolute latest that technology has to offer, the PreSonus Studio 1810c is a great go-to interface. It is the newest interface on the list, and allows four hybrid inputs at the front, and allocates an extra four 1/4″ line inputs around back so your smaller band can be easily recorded all at once. It also allows phantom power to be applied to all four inputs at once, and it even has MIDI and S/PDIF digital inputs around back for even more versatility. Because of its modern-day build, this interface connects to your computer via USB-C for a stunningly fast digital connection. If you’re a songwriter that regularly records your own band, or are otherwise in a situation where you need more than four simultaneous XLR inputs and preamps running at the same time, the MOTU 8pre USB audio interface is the right tool for the job. It has eight hybrid input connectors at the back of the unit, meaning you can plug in up to eight microphones and run them all simultaneously. Additionally, something that sets this unit apart from the rest is the ability to apply phantom power to each individual input, rather than to all of them as a whole. The MOTU 8pre also comes equipped with a station to select and monitor your clock, and includes MIDI I/O and optical I/O on the back as well for additional inputs. This interface connects to your computer via Firewire, and although it is not as up-to-date technology wise, for purposes of simple recordings, this will definitely do just fine for all intents and purposes.